I am not quite sure what it is about a train... Something in the sounds evokes many thoughts and images. Sitting in my classroom, I hear several daily train whistles. I know they are almost entirely freight trains, merely transporting items from here to there, but that doesn't stop the imagination. Even the school children perk up and listen to the train whistle signaling its arrival nearby. I think that the sound of the whistle is almost like a promise. It is a promise that life is still moving forward. People still have places to go and things to do. 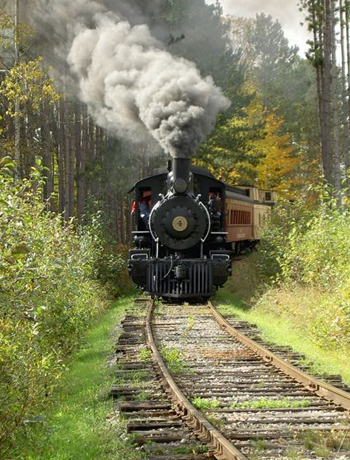 It is a promise that one ride on a train will take you on adventure away from the ordinary. Sometimes, it is a promise of greener grass and sunnier days. Sometimes it is the hopes of a great escape. It is a wistful, wanting sound. Maybe, it is really a sound of hope. As long as the train whistles, there is something to hope for. Now I know, we are to strive to live contented lives. It is a mandate from our Maker. I know that too much wistful thinking is not good for the soul. But a little wishful hoping can be medicine for the heart. Hoping for something means trying for something. It means dreaming and working for a better future. It means perseverance. Not all wistfulness is foolish! I rode on a train once. (I have been on many small trains for entertainment) However, one time, I really rode a train. I, and another girl, took a 1,000 mile train ride through Russia. We left in search of Moscow, and it was a scene straight from a movie picture. We had our own sleeping car, table, and tea set. There was a dining car and a small restroom to be shared by many travelers. We crisscrossed the terrain for over two days. I almost hated to sleep because it was such an adventure. The train was very old and looked much like the one in my picture. We made many stops to pick up travelers. Each stop brought vendors and flower-selling peasants. It was, in many ways, the ride of a lifetime. We landed in an extrememly large and busy Moscow train station. That trip was one to never forget. Once our stay was over in Moscow, we boarded the same train to return to our little village in Siberia. That ride will always embody all the thoughts I have when I hear a train. When the whistle blows, I want to find a suitcase and ready myself for traveling adventure. I suppose in general, I want to be ready whenever necessary to take that next step into the unknown. I want never to be so stuck in my ways that I cannot take the next train to what lies before me. Until the train leaves the station, I will busy myself with my daily tasks set before me. But note... the suitcase is in reach! Is yours? Another lovely post, Leah. I enjoyed reading your mom's today too. There is another blog that I love to read...not sure if you're familiar with it or not....this family goes to Darin/Jody's church out in Texas...they are expecting blessing #8....she's a great writer and you'd love her perspective and insight, I believe. Her blog is "resolved2worship.xanga.com" Keep writing and being a blessing!